Shmuel with the broken arches of the Sixth Street Bridge. For the past few months the demotion of the Sixth Street Bridge has been pushing its ways through the Boyle Heights Flats. Knocking its way through an area mostly filled with industrial and wholesale produce warehouses, just adjacent to a residential neighborhood and low-income housing projects. How are we going to be able to continue to tell our important local narrative when so many places are being demolished and changed all around us? What is the real cost to our local storytelling when we see have our historical landmarks demolished? Today we are coming to witness what it all looks like from up close. And to try to recapture some memories for ourselves and posterity. This day we choose to come in from the direction of Fourth Street, and enter by the train track inlets located there at Mission Road. Making our way towards the direction of the Sixth Street Bridge, which could be seen just beyond the rows of boxcars and tankers on the commercial trains tracks that line the eastern bank of the Los Angeles River. In terms of the storytelling of this area, this really is the most authentic way to make our way down towards the riverbed. For people who come from the Flats and from the more dense parts of Boyle Heights north of here, this is the path remembered most for taking for when venturing over the train tracks. This is the past most often taken by old school locals from the barrio who linger around the riverbed. Making our way to the hole in the fence which leads to the riverbed below. Since the earliest days these areas have always attracted the local kids like magnets. Especially the area around the train yards. The train yards have been here since the beginning. Actually in the first booming years of Los Angeles, this was even more active with train activity than today. Just on the other bank of the river there was the main train terminus for the Atchison, Topeka and Santa Fe Railway, located at La Grande Station just over on Santa Fe Road. Which required vast areas of train yards, yards where traffic often slowed down in the evenings and to a hault on the weekends. Quickly this surrounding area became a youth hub, for kids who had nowhere else to go. And not just for local kids. The train yards also became the home of the hobo boxcar kids that were coming west during the Great Depression. This area even early on became the destination for car clubs; a real life version of Thunder Road from the movie “Grease” (1978), which was filmed in the riverbed below. For both racing and cruising, the vast empty areas around the viaducts would become a rallying point. For many reasons this area became associated with the youth subcultures. Now I have to stress this. So much a part of the local narrative is this place and our relationship to it that it is enshrined in our local art and writing, and also on film. You will see the Sixth Street Bridge memorialized in notorious barrio themed films and cult classics. 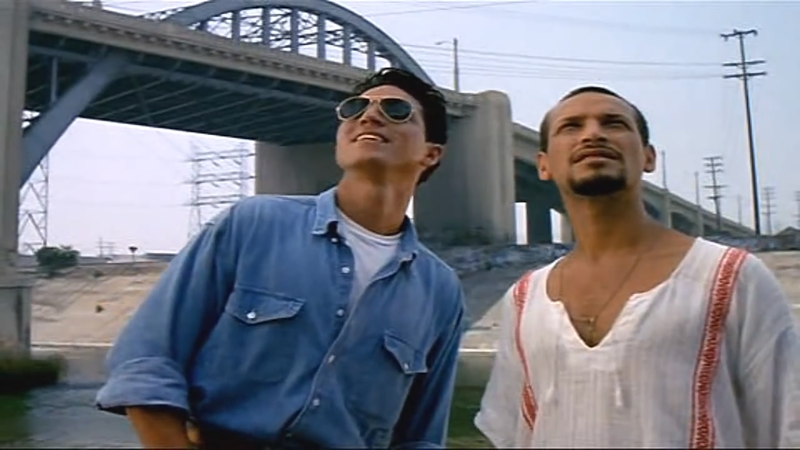 “Blood In, Blood Out.” (1993) In this infamous shot you can see our old hangout right between their heads, the best observation point on the Sixth Street Bridge. In “Blood in. Blood Out.” (1993), the dramatic ending of that film brings the story and the characters back to this bridge to fully evoke a sense of youth-like nostalgia. And in doing so this film captures some of the most impressive views of this bridge as the camera rises from the riverbed and takes flight over the viaduct at the very end of the film. The reality is that historically these bridges have served dual purposes in our lives, edifices which have united and divided us. These bridges which have connected us with the bustling city center, these same structure have long since mentally marked the lines of segregation. And this is not by accident that these bridges come with this complex psychology. In the Jim Crow era it was clear that a Mexican American’s place downtown was as the help, but not for recreation and pleasure. While the older generation tended to abide by this apartheid, it was the youth who would challenge these boundaries and dare to take claim to the city that they felt was just as much their as everyone else; which came with backlash, as witnessed during the notorious beat-downs of the so-called Zoot Suit Riots. Since then legal segregation has ended, yet the racial and economic divide here has only grown. Therefore for generations of youth, our coming here has been a challenge to the boundaries of the racial and class divide which has defined this area for almost a century. Though now as these landmarks are having holes ripped through them, its hard not to feel like they are demolishing part of our story. July 9, 2016 – The bride to nowhere, and the double arches. August 6, 2016 – The eastern arches removed. For those of us who have grown up on the eastside, we have always had this complicated relationship with the bridges. I have so many memories. Some of them good and some of them bad, but they are all part of my life story. As a child going over the Sixth Street Bridge into the westside came with a great sense of trepidation, for us to be crossing over into a world that was unknown to me and often seemed more hostile towards us Mexican Americans. And then passing back to the eastside – either going over the bridge or driving through her expanse stretching over the freeways of the East LA Interchange – I always felt this great sense of relief. As soon as we crossed I could exhale: I was home! The first time I started going to the westside regularly was when my sister started chemo therapy for childhood leukemia back in 1984; she was four years old and I was seven years old. My sister was getting treatment at Children’s Hospital in Hollywood. This really amplified my anxiety, I didn’t like going westside. Though as we came over the Sixth Street Bridge on our return I would get all excited and have my face plastered to the window. I was just enchanted with the area surrounding the viaduct. My mom would warn me to stay away from there, but you know as soon as I was old enough I started hanging out there myself. Many years have passed since then, still that sense of relief that would wash over me while passing back to the eastside by way the Sixth Street Viaduct, that would remain until the very end. What are your childhood memories of this place?